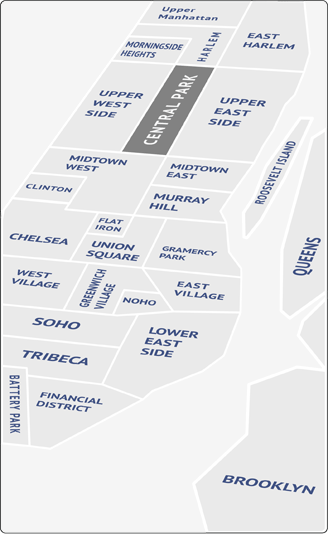 SoHo (which stands for South-of- Houston) extends from West Houston to Canal Streets, from Bowery to the Hudson River. Once a drab manufacturing area, artists began moving here in the early 1970's. Attracted by cheap, gigantic lofts, they turned them into homes and galleries. SoHo has since developed into a beautiful and trendy neighborhood. Though it remained a hidden bargain for many years, SoHo has arrived as an upscale residential and retail neighborhood. Surrounded by 19th century cast iron architecture, the entire neighborhood is the city's only landmark district and is famous for its shops, galleries and some of the city’s best restaurants. A walk along Broadway takes you past the downtown branches of just about every Madison Avenue boutique, and rubbing elbows with the countless fashion models who have taken up residence here. Though famed for its chic lofts in prewar, cast-iron buildings, SoHo has a good mix of different housing stock, including more affordable digs for the rest of us. SoHo offers a surprising variety of dining options, from cozy little hideaways, like Kin Khao (a Thai place on Spring Street) to bustling eateries like Blue Ribbon Sushi on Sullivan Street. Spring Street and its immediate environs host a sizable collection of French bistros, including standouts Balthazar, Bistro Les Amis, and Raoul’s. In addition to its art galleries, this neighborhood hosts the Guggenheim Museum SoHo, the New Museum of Contemporary Art and the Museum of African Art. Theaters, from small spaces like the Here café, to more established off-Broadway venues On weekend days, the streets of SoHo are thronged with shoppers, but at night, things quiet down, and the bar scene is generally laid back and casual. Between its shopping, arts scene and Little Italy, SoHo is established as a destination neighborhood in New York.